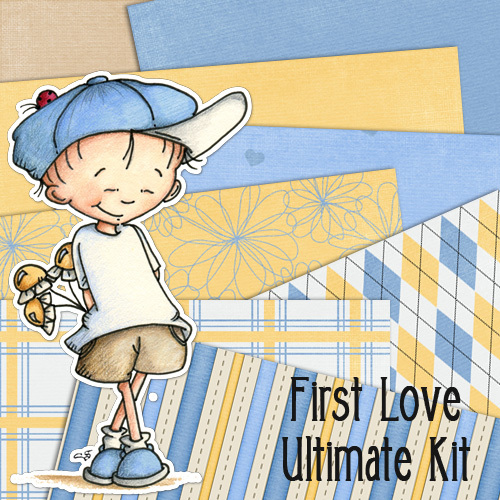 This little sweetie is a precolored digi image from the First Love Ultimate Kit by Paper Creator. 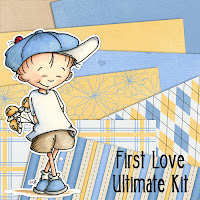 The yellow and blue diagonal stripe paper and solid blue paper are also included in the kit. Designed the card layout in Silhouette Studio DE software and cut out with my Silhouette Cameo. If you plan to place and order, please enter code DELORIS to get a extra 20% off the total. 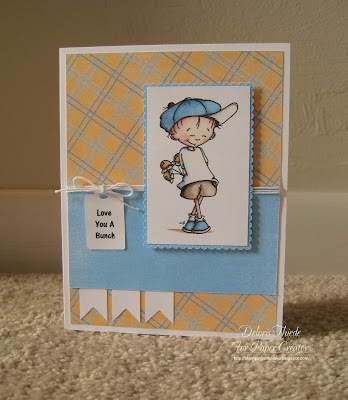 A great little boy card. In about another year I hope I can start making more little boy cards for my grandson to enjoy. Him being so little, he doesn't understand. Of course, as he gets older, he can enjoy looking back at what I did for him. Great set of papers. Perfect for any young lad! Adorable kit! Such a sweet card Deloris, I love the colours in this kit. Wonderful card Deloris! The image is adorable. I love how this turned out! It is absolutely adorable and you really brought this scene to life perfectly with the way you laid out all of the elements! I love the mellow color palette, yet it is still so full of life. The patterns look amazing together and I'm so glad you shared your talents with us for this week's Simon Says Stamp Monday Challenge! Your card is so cute ! I love it ♥ Great layout .